NGOs have to get support, funding, financial help and donation to get work, execute, implement and accomplishment the aims, objects, aspirations, ambitions, desires, causes and targets they desire to fulfill and they have decided, they are working on and they have to achieve them. To get funding and other support, NGO has to submit project proposals in pre-formated certain patterns and according to requirement and guidelines of donor agency, support groups and funding agency or Government Ministry/Department. Projects for funding are submitted in a such a frame work that explain the issues, needs and requirements of the plan, why the need of fund and support is and the way how the NGO and beneficiaries will implement it. 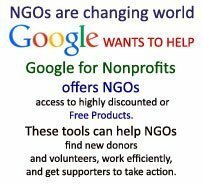 So NGO has to prepare and submit the project proposal to raise support and get financial and other resources help from contributors and donors. Role of Consultant: Main matter regarding to contact and decide any consultant is that the role of consultant is just to suggest the projects, suggest about the Funding agencies who are providing funds in certain areas, certain issues and certain beneficiaries; about the Government Departments and donors. The role of NGO consultant and NGO consultancy is to prepare documents according to exact requirement and formats and suggest to submit through proper channel. At funding part the role of consultant is just to observe and prepare your NGO’s profile, prepare documents, prepare project and guide you to submit it . Do you want Funds surely with guarantee?!!! 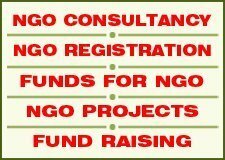 Apart from approaching funding agencies through the proper consultancy patter and parameters many person associated with NGOs and many NGOs want fund, want money surely in any way and manner. So for this they try to contact the broker to get funds and money. There are some kind of such brokers who are searching for such needy and greedy persons and NGO representatives who wish to get funds ‘surely’ in any way. Such persons and NGOs who wish to get funds to pay brokerage can find such brokers and such brokers find such persons. The brokers require their commission with a claimed assurance to get funding ‘surely’. Keep in mind that no one can claim to provide you funds surely without performing the basic requirements. What are requirements to get funds? To get fund the NGO must qualify for the guidelines and parameters of donors, funding agencies and Government Ministries. Is it fair to get money surely in any condition? If you ask any person or agency to get ‘sure funds’ and if someone claims and assures you to get funds surely without checking your documents, your area and beneficiary and without before knowing the requirement of supporter and donor, that is very clear that you have to pay the brokerage to the broker and there is no guarantee to get funds even after paying brokerage. If your NGO is entitled so either your NGO can get funds, otherwise your NGO can not get funds.So if your NGO is entitled to get funds and support then you do not have to pay any brokerage or bribe to anyone. You just have to pay consultancy charges to consultant and move ahead to get funds. Once the payment is made to broker then it if offense at both part, means offense of both the persons associated with NGO who are paying brokerage and the persons who are getting brokerage in the name of providing funds ‘Surely with Guarantee’. If some one is paying brokerage and bribe (rishwat) to anybody means it is clear that the person or persons are not working according to the parameters of NGO and basic objects of NGO. NGO is to be formed for making positive changes in society and to finish corruption but if the member of NGO are associated to provide corruption then it is clear that they are performing a unfair money business in the name of social service and NGO. There are some persons against them legal action was taken who assured NGO representatives that they will surely get money, but they couldn’t able to provide funds ‘surely’. If your NGO is entitled then you only have to complete the required documents and submit then you will get the funds without brokerage. If your NGO is not entitle then you won’t get fund. To provide and to get brokerage in the name of ‘get sure fund’ is offense of both the persons who provide it and the persons who get it. Please keep in mind that private funding agencies, donor agencies and companies under Corporate Social Responsibility (CSR) you do not have to pay commission or percentage of funds to any person. If you and your NGO team is not able to prepare documents, concept note and project proposals then you have to contact and have pay consultancy charges to Consultant and consultancy for documentation and consultancy. So what to do? And how to prepare documents? What is role of Consultant? The role of consultant is to guide you in better way that how to get funds and where to get funds. The role of consultant is to prepare the documents in proper way so you will almost surely get funds if your NGO is entitled for that and if your NGO ranked among the top applicant NGOs who are applied for fund and support. Your NGO will get funds if the concerned funding or support agency’s or Government Ministries parameters and fund limit are available according to requirements of your NGO. And if you will not get funds then you only have to pay for the documentation consultancy charges for that the consultant, document writer and consultancy. Consultancy service and charges are legal and consultancies are legally entitle to get consultancy charges, whatever is decided between NGO and the consultant/consultancy. If you want to know how and where to get funds for your NGO and what parameters, formalities and documents you have to complete and submit then you can contact NGO Consultancy here. http://www.NGOsIndia.net. For more detail to get funds and raise funds you can contact at 093 11 33 00 44.